Lonely Planet: The world's leading travel guide publisher Where To Go When, the ultimate trip planner for every month of the year, is a beautifully illustrated book that is both practical and inspiring. For every month of the year it presents 30 recommendations of destinations that are at their best during each month, whether due to their climate, or value or because there's a lot going on. The suggestions feature every flavour of travel experience from culture-rich city breaks and tropical beach holidays to adventurous road trips and wildlife-watching expeditions. Every corner of the planet is covered so you'll find out when the best time to see mountain gorillas is or to go shopping in Paris. The book is organised by month. At the start of each chapter a flowchart guides you through the options so readers can filter the recommendations according to their interests. Whether you're into beaches, trying the local specialities or backpacking off the beaten path, there will suggestions for you. Diagrams also depict the climate, value for money and family friendliness of each suggestion in the month. Then Lonely Planet's authors explain in detail why each destination has been selected. The text describes the place and why it's special at that particular time. The destinations are illustrated by inspiring photographs and have a small infographic that shows the key reasons to go. Practical details make the first step of planning a trip easier. 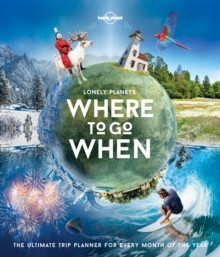 About Lonely Planet: Started in 1973, Lonely Planet has become the world's leading travel guide publisher with guidebooks to every destination on the planet, gift and lifestyle books and stationery, as well as an award-winning website, magazines, a suite of mobile and digital travel products, and a dedicated traveller community. TripAdvisor Travelers' Choice Awards 2012, 2013, 2014, and 2015 winner in Favorite Travel Guide category 'Lonely Planet guides are, quite simply, like no other.' - New York Times 'Lonely Planet.